RAM MOUNT V-SHAPED BASE and 1/4"-20 STUD BASE The RAM Mount Powder Coated Marine Grade Aluminum Standard 3.0" Double Socket Arm has a socket at either end to allow a 1" diameter ball accessories to be connected. On one end comes a 2.5" Round base with a 1/4" x 20 stud for attaching any type of camera (Digital, Camcorder, etc). On the other end is a V-Shape base for Rails and Yokes to attach to any rail from 1.0" to 2.1" in diameter. Perfect for boats, bikes, retail, where a flexible and strong mount is required to stand the test of time. 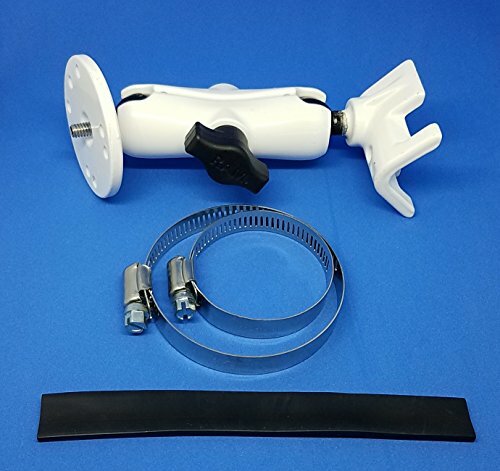 Composite standard double socket arm, has a socket at both ends that accommodates 1-Inch ball bases Patented universal rubber ball and socket system allows you to mount virtually anything anywhere. A single spring inside the arm opens the end sockets, allowing you to pivot the ball and socket connection Dimensions Arm: Overall Length: 3.69-Inch, Socket-To-Socket Length: 3-Inch High Strength Composite Superior shock and vibration isolation for electronics Unique design provides easy installation, mobility, strength, adjustability and versatility Construction provides a light weight and corrosion resistant product Place the saddle shaped plate on the rail then wrap the metal clamp strap around the rail and plate Included in Kit: (1) QTY 6" long metal strap, (1) QTY 8" long metal strap, (1) QTY 5.5" rubber strip that supports the metal straps to avoiding scratching or marking of the rail Powder Coated Marine Grade Aluminum Components are the standard black aluminum and rubber materials, and the metal pieces were painted white by RAM to suit with light colored environments. All kits are new and sealed in bags as from the manufacturer.